Yes, How do I know? Because I have trained my two kittens to go out with me on a harness. I won’t say it’s easy but with patience, perseverance and lots of understanding you can train a kitten to become accustomed to wearing a harness. I would say the older the cat the harder to achieve so always try to start as young as possible. It took me 8 weeks. 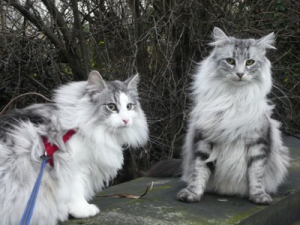 Obviously cats have different personalities so if you feel your cat would hate to go out on a harness or if your cat shows any signs of major distress STOP – AND LISTEN. and the harness’s everyday for a least two weeks. on the kitten before his/her main meal time. Always associate this with meal times or treats so that the kitten associates putting on the harness with something nice. At first there will be a struggle but the motto here is try try try again. Never give up! Start with 5 minutes a day congratulating them and reassuring them every step of the way. They will soon realise that the harness leads to treats and cuddles and all good things. This part of the training takes the longest so be very patient. As you see your kitten getting more comfortable with wearing the harness extend the time that it is on. Soon they will be playing totally unaware that they are strapped up in a strange gizmo and you can give yourself a pat on the back that the hardest part has been conquered! Make sure you leave enough space around the neck of the harness so that it is comfortable and not too tight. Test this by putting 2 fingers between the neck of your kitten and the harness. This applies to the body of the harness too. NEVER EVER leave your kitten unattended wearing the harness as it could get caught up on anything during playtime and lead to strangulation! • Once you can see that your kitten has adapted to this strange looking thing around it’s body then you are ready for the next step, attaching the lead. Do this process slowly. Remember small steps will eventually lead to major leaps! Let your kitten walk along at it’s leisure with the lead dragging along. Don’t attempt to lead the walk, as it will never work! Even when you get to the stage where you go out with your kitten on a harness you will never be leading, they will! My kittens tended to play with each others leads and not much walking was done so I tried to separate them first which they didn’t really like so I quickly had to jump onto the next stage, taking them out, so that they understood what the lead was for. • Now this next stage is very important. ALWAYS take your kitten out in the basket to the area which you want to walk them. If you just take them out the front door they will always try to dash out whenever you open the door. Mine now climb into their carrier as soon as it’s out as they know they are going somewhere nice for a walk. They never rush to the door to escape whenever I walk in. If you have this problem buy a small water pistol. Carry it with you in your bag and when you enter your home, if they are near ready to run out, squirt them with the water. They will start to associate the front door and what’s outside of it with a nasty squirt of water in the face so that should knock that little game on the head! So always use the basket. You will thank me later. • Make sure the harness is on secure and carry the basket from the car park to where you are going. Open the door and let kitty come out in it’s own time. Be patient and always offer words of encouragement and reassurance. Make sure you attach the lead BEFORE they take their first steps out into the big world. My kittens made my job easier at this stage as they really enjoyed be outside and, although nervous at first, they soon had a ball sniffing the grass, chasing butterflies and climbing trees! If your kitten does go to climb a tree that’s great but don’t let them go to high. Always be in control and hold that lead TIGHT! When you are both relaxed at this you can buy small puppy extendable leads which will give kitty more freedom to run along and chase things. It is never going to be like walking a dog. They go where they want to and when they want to so you just have to let them be cats and enjoy watching them lead YOU all over the place. Please be aware of dogs and foxes in your surroundings! They are quick and will chase your kitten so if you see one pick your kitten up straight away. It’s always much better to go somewhere quite and dog free if you can. A trip just outside London to the country can be a real treat for you both if you have a car and normally any wooded areas are quiet during the week and you will hardly see any people walking their dogs.